Spray salmon lightly on all sides with olive oil cooking spray and sprinkle lightly with salt and pepper. Place one salmon fillet, skin side down, on square sheet of foil. Wrap the ends of the foil to form a boat shape. Combine the tomatoes, shallots, 2 Tbs olive oil, lemon juice, oregano, and thyme in a medium bowl. Spoon the tomato mixture over the salmon. Fold the sides of the foil over the fish and tomato mixture, covering completely. Make sure the packets are sealed closed. Place the foil packet on a heavy large baking sheet. Repeat until all of the salmon have been individually wrapped in foil and placed on the baking sheet. 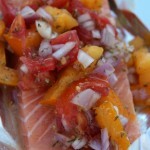 Bake salmon for about 20 minutes or until cooked through.Transfer the foil packets to plates and serve. Much thanks to Giada De Laurentiis for inspiring this recipe. Marissa, I think you’ll really like it. It’s so juicy and the tomatoes and shallots just make the salmon pop! I love Salmon and this looks so good!! Pinning so I can remember to try it later.